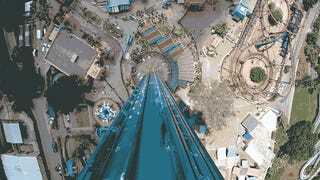 Amusement parks love those heart-stopping vertical drop rides because they don't take up much space. But when you've ridden one, you've ridden them all. At least until Busch Gardens' new 335-foot tall Falcon's Fury ride is open to the public. When riders get to the top—as many as 32 at one time—their seats are tilted forward 90 degrees so that they're directly facing the ground when released. And during the first 100 feet of free fall, they'll actually achieve a speed of around 60 miles per hour before a magnetic braking system brings them to a safe and upright stop.